Maria and I are getting the launch ready for “Food for Thought“! Every two weeks until publish date, December 4, I will share a recipe from the book. Two years in the making and now it’s finally happening! A portion of the proceeds from this book will go to The Women’s Alzheimer’s Movement, an organization founded by Maria. The Women’s Alzheimer’s Movement is dedicated to raising awareness about women’s increased risk for Alzheimer’s disease and to educate women and men about the lifestyle changes they can make to protect their brain health. Here is one of them: FOOD, that’s where I come in. You have heard me talk over the last two years about the importance of feeding your brain. 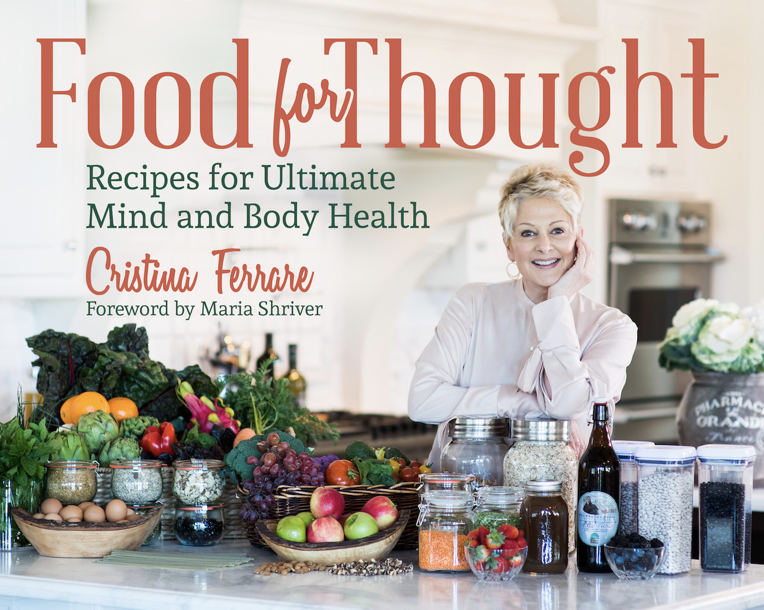 Many hours of research went into “Food for Thought.” This cookbook contains information that is important to gut, heart and brain health. I break down the ingredients and recipes that are contained in the book so you understand the nutritional value, how it helps to heal and keep your body and mind strong. I brought this recipe back from South Africa when I had the honor of attending the opening of Oprah’s Leadership Academy for Girls. It was a life-altering experience, a story for another time. On the schedule was a safari, (no way I was going to miss that) and after a long mind-blowing day, we settled into our camp site. As the sun set, and what looked like a gajillion stars lighting up the night sky, we sat down for dinner. To be honest I thought “I” was going to be someone’s dinner, I could hear growls in the distant and heavy breathing coming from the bushes. 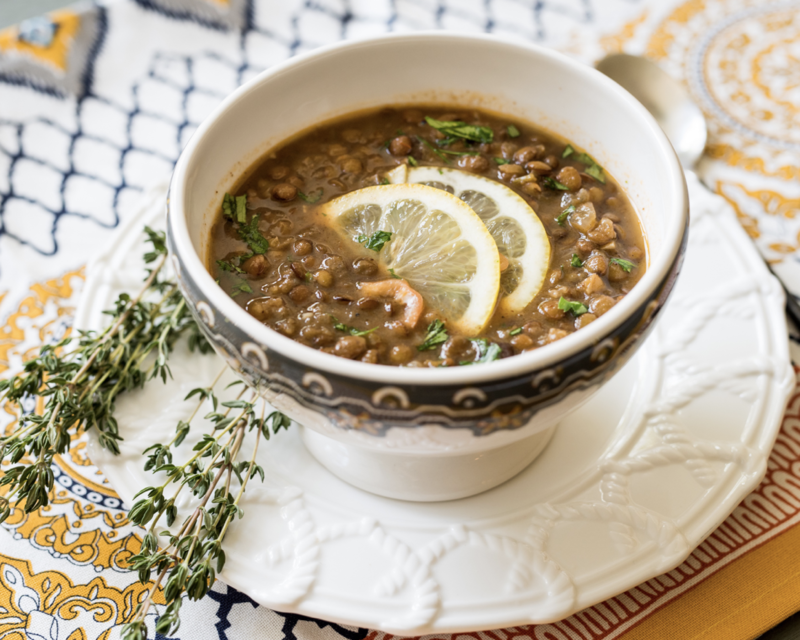 I wanted to share the recipe for this lentil soup with you not only because it is delicious but because of the many health benefits of lentils. Lentils have many of the components that are necessary for gut health. Lentils help lower cholesterol and are great for heart and digestive health. They help stabilize blood sugar, increase energy and are a great source of protein. While I don’t grind the spices such as cumin, coriander, ginger and cinnamon myself like my new friend Ayo the cook in Africa, I do buy the best quality spices in small packets at health food stores. Buying in smaller portions keeps the spices fresher and full of potent flavor. Add all of the ingredients into a Mason jar or small glass container with a lid. Shake well and set aside at room temperature until ready to use. In a soup pot on medium heat add onion and cook for 8 minutes, stirring occasionally until softened. Add in the garlic cloves, salt and pepper cook for 1 minute. Add cumin, coriander, ginger, cinnamon, cayenne and tomato paste, mix together well. Turn the heat to low and cook for 1 minute stirring constantly. Pour in 1-1/2 quarts of chicken or vegetable broth, bring to a boil. Turn heat to low and simmer for 15 minutes. Pour in the lentils and bring to boil, then turn the heat to low. Simmer stirring occasionally until lentils are soft—approximately 30 minutes or more. Taste to see if they are cooked through, the lentils should be soft but not mushy. If you see the soup is too thick add-in more chicken or vegetable broth ½ cup at a time. Stir in lemon juice and correct seasoning adding a pinch of more salt if needed. Save any leftover spiced oil and use over omelets, eggs, avocado toast, creamy soups, grilled fish and veggies.